When Baranuski realized that Rin has not been killed he is fearful of Zeref's punishment and decides to flee as far as he can to the Northern lands and go into hiding. The plan had failed and Baranuski no longer wants to be a part of Zeref's evil plots. When Baranuski fails to return and Zeref finds out that Rin is still alive he is extremely angry and frustrated that he is not able to succeed in his attempts to gain power. However, Zeref is determined and stubborn; he will not give up until he has what he wants. For now, Zeref sits and waits patiently for another plan to come to him. Meanwhile, Rin is staying at the village and being looked after by Lady Kaede, Jaken and Au Un. Sesshomaru comes to see her as often as he is able to. The weeks are going by without any incidents to Rin which is a great relief to Jaken not having to risk his life. Kohaku.... who is still feeling the hurt of losing Rin and not wanting to bump heads with Sesshomaru, has been staying away from Rin and trying to move on with his life, He has been feeling better with each passing day about Rin and Sesshomaru's marriage. He has even met a lovely girl from another human village that hired him to slay a demon recently. Kohaku has been spending much time with her lately and she has helped to ease the pain of his broken heart. Rin is in her sixth month of pregnancy and will be giving birth to her child any day now. Sesshomaru stays near by the human village and begins to visit everyday in anticipation of his child being born. The day of Rin's labor, she is lying in bed on the futon in Lady Kaede's hut. The labor seems to be a bit painful for Rin and is lasting a long time. Jaken is feeling sorrow for the ​pain Rin is experiencing as Lady Kaede informs Jaken that it is normal for a woman to have pain during child birthing. Sesshomaru shows up at Lady Kaede's village and stands by as Lady Kaede and Kagome help with the delivery, Inuyasha stands by as well holding his son whom is only a 7 month old himself. Rin is in much pain, Sesshomaru hates to see Rin's suffering but he is aware that this is a normal occurrence that will end shortly so he stands by silently waiting for the arrival of his child. Lady Kaede exclaims, "Ok, the time is nearing..the child is ready." Lady Kaede instructs Kagome to have the water and towels ready to clean the child once it emerges. As Rin pushes several times on Lady Kaede's command the child appears. Kagome exclaims, "It's a beautiful baby girl!" Kagome uses Wet and Dry towels to clean the child and she walks the baby girl over to Sesshomaru. The half demon girl child has beautiful silver hair and golden eyes that resembles her father but the cute dog ears similar to Inuyasha's representing the form of half demon. Sesshomaru looks down at the child with little expression as she wiggles and cries in Kagome's arms but his thoughts are that even though Heroshya is his Pride and Joy this beautiful baby girl is his most beloved and precious asset. Rin shuts her eyes and lets out another loud wail; Sesshomaru wonders why Rin still seems to be in pain now that the child has been born. Lady Kaede instructs, "Kagome, give the child to Lord Sesshomaru..I still need your help another is coming." Kagome with shock in her voice, "Another??" Sesshomaru takes hold of the first child as Inuyasha states the obvious, "Twins!!" Lady Kaede tries to let Rin rest a moment before she must push more to release the second child but it must happen soon. Rin resumes pushing as the second child appears. Kagome can hardly believe her eyes, she cleans the second girl child as she exclaims, "They're not identical, this one looks different." Inuyasha and Sesshomaru are anxious to see though they wait patiently for Kagome to clean the child and bring her over. When Kagome brings the child over Sesshomaru sees that she resembles Rin; he thinks: She possesses her mother's beauty in every way. The second girl child has brownish hair and brown eyes exactly as Rin but she also has the dog ears that represent her half demon state. Rin's pain finally ceases but she is exhausted and wondering what her children look like, she asks Lady Kaede..."What do they look like? " Lady Kaede informs her, "They are gorgeous baby girls ; they are fraternal twins, they look nothing alike. One resembles Sesshomaru and the other resembles you." Sesshomaru goes to Rin and hands her the first white hair child while Kagome hands Sesshomaru the second dark haired one for him to view her more closely, he then hands over the second child to Rin as well for her viewing. Each child lay nestled on either side of Rin as Inuyasha asks Sesshomaru, "What are you gonna name them?" Sesshomaru responds, "The elder child will be called Nephra and the younger will be called Zephra." Sesshomaru does not explain why he chose those names to the group standing by but his strong senses has already made him aware from the moment he held each of his daughters that Nephra, the older girl will be calm as water however Zephra, his younger girl will be destructive as fire thus helping him to chose the name for each. 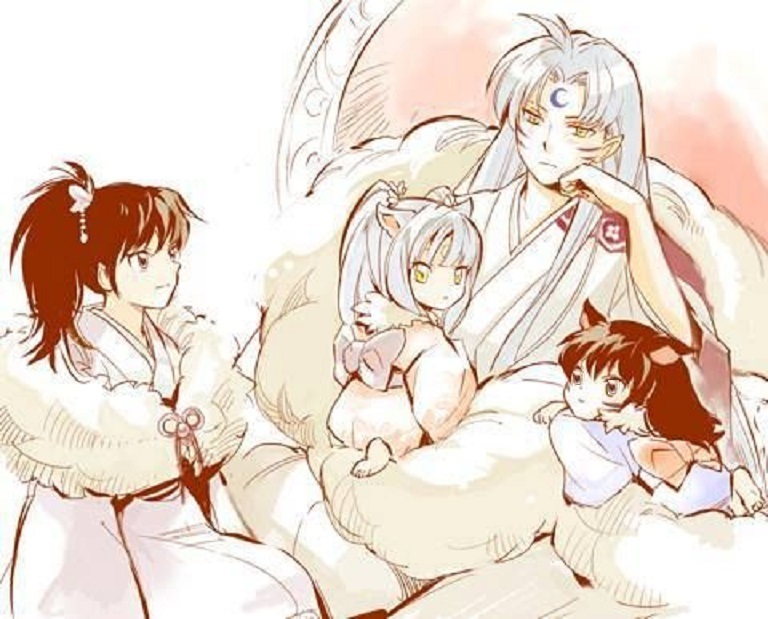 After Rin has a few days to rest, she and Sesshomaru along with Jaken head on with their daughters back to the empire. Rin is extremely happy to be a mother even though raising two girls at once is a handful for her. Sesshomaru having many important matters pertaining to his empire and ruling over the West, is unable to assist Rin with the care of their two daughters so he appoints servants to assist her when she needs it. Jaken is back and forth helping either Rin with the children or at times traveling with Lord Sesshomaru as his Chief Minister and adviser. When Jaken is with the two little girls he finds himself enjoying every minute of it, they remind him so much of his great master Sesshomaru and sweet Rin that he looks after them as if they were his own daughters without any order from Lord Sesshomaru. The girls are half demon so they are growing rapidly as the months go by it seems that in no time at all they are crawling around and their features are becoming more vivid with each passing day. They are intelligent, able to speak and communicate at an earlier age than a typical full human child would. Rin tells Sesshomaru that she wishes to take the girls to the secluded family forest and begin training with the girls there after some time, She wants them to be skilled in the slaying of demons or anyone that tries to harm them. Rin is aware that the girls will have a vulnerable night when they will take on a full human state. This night occurs for them when the Gemini star constellation forms in the night sky. This can happen on any night but usually only occurs once a month. ; Sesshomaru feels that training the girls to defend themselves without the use of their demon powers is a wise idea. Rin enjoys taking Au Un and the girls to the beautiful forest belonging to her husband where they can frolic and play in the meadow and the blue lake there. They spend most of the day there and Rin begins to slowly teach them how to balance themselves, how to jump and maneuver their body movements. Each time they go to the forest she teaches the girls a bit more and as expected they catch on to it well. After four years Nephra and Zephra appear to look 8 years old physically; they are both learning and successfully executing the fighting styles but Zephra excels in this and enjoys it so much that she practices even when Rin is not teaching her. She often wants Nephra to practice with her all the time but Nephra has no interest in practicing or sparing when she's not being told to by her mother. Although Nephra is learning well and is good at the fighting techniques... she prefers to enjoy her free time picking flowers, feeding Au Un and playing in the meadow much as her mother used to when she was little, however Zephra grows tired and bored with no one her size to spar and fight with. Zephra knows of some demon children that are living with their parents at her father's empire, some do not like her and her sister Nephra because they are only half demon...Zephra wants to use this opportunity to practice some of her skills as well as test out the few demon powers she possesses. One evening, She asks Nephra to come out with her to walk to the demon village side of the empire where she knows the demon children usually are, she convinces Nephra to come with her and tells her they can pick berries for mother to bake a pie but Zephra's real intention is to test out her skills. Nephra is suspicious of her sisters intentions and asks her what are they really going down to the demon village for. Zephra informs Nephra, "There are some kids in the village that don't think we are worthy of our father's empire because we're only half demon, I want to show them they are wrong....don't you want to test out your powers Nephra, See how they work?" Nephra replies, "I guess so but I don't want to hurt anyone." Zephra assures her, "Don't worry, we won't start anything... we will leave it to them to initiate a fight and when they do we can test out our fighting techniques and demonic powers. If it gets back to mother and father , we'll tell them that we went to pick berries and some demon kids provoked us to fight in order to defend ourselves." Nephra provides one more dilemma, " Mother will have Jaken accompany us you know." Zephra thinks, "Hmmm, well we can find a way to ditch him." Nephra is not crazy about the idea but does desire to see how effective her powers and fighting will be when really needed so the girls set their plan in motion. They find a way to lose Jaken and head to the village where the demon children are and as predicted a couple of demon kids cause them trouble. Zephra and Nephra are able to test out their fighting skills as hoped for and they are excellent at it. Nephra uses her demonic powers which are the ability to speed step, use of demonic whips and the ability to discharge demonic energy from her hand to create a blast. Nephra chooses not to use the full intensity of her blast in order to avoid killing the demon children of her father's empire. Zephra on the other hand uses all of her demonic powers with much force, these are the ability to: Float in the air and dart at quick speeds, ability to shoot poision darts from her claws and the thrusts of slash blades which are similar to Inuyasha's blades of blood. In fear of their lives the demon children flee swiftly, they noticed that Nephra was light on them but Zephra came at them with all her powers and force, causing them to feel respect for the Princess Nephra but hatred for the Princess Zephra. Zephra is so excited she turns to Nephra and says, "That was so great! I feel so empowered!" Nephra says nothing and feels some shame but then a young man's soft voice behind them slightly laughs, " haha,Do you foolish half breed girls think you can be equal to full demons? Don't You know that you have made enemies of these demons now, When they grow they will come back for you with a vengeance Zephra?" Zephra turns around; there stands a young man that appears to be the age of about 18, he wears his long silver hair in a pony tail and he resembles her father. Nephra observes and shouts in excitement, "Heroshya!!" Nephra is happy to be seeing her older half brother again but Zephra is not impressed and responds as she walks past him with her head held high, "Huh, when I want your advice...I'll let you know. Though that is most likely never to happen in this life time." As Zephra begins walking back to the castle, Nephra asks Heroshya, "Are you here to visit with father?" Heroshya responds, "Yes, where is he? At the castle?" Nephra responds, "Yes, I believe so." Heroshya begins to walk back to the castle and Nephra walks beside him...Zephra far ahead of them. Heroshya has no use for Nephra but she is tagging along and is talking about any and everything. She shoots out questions, she asks him...where he goes when he leaves, why doesn't he come to the castle to stay and she asks if their father is making him a sword soon. Heroshya answers her questions with quick, short responses not wanting to bond with her. Heroshya looks at Nephra as they walk and thinks: This girl just wants to be friends with any and everybody, I can't believe my father's blood flows through her but she does resemble my father and I. However, that other one, Zephra...there's no question she is of father. When they reach the castle, Jaken is waiting for them and is most unhappy of the girls losing him on purpose; he shouts at Zephra who is first to reach the castle due to walking swiftly ahead. Jaken says, "You mischievious little demons! You head right inside and speak with your mother!" Heroshya heads forward to speak with his father while Nephra heads on to find her sister and mother. Heroshya walks down the long corridor towards his fathers throne. He is young, tall and handsome, wearing a long cloak with his normal fighting outfit and has a sheathed sword in his sash that he had created by a swordsmith. when he reaches his father he kneels and bows his head while greeting him, "Hello Father, you've summoned me?" Sesshomaru answers, "Yes, Heroshya we have much to discuss." Sesshomaru first tells him that the time has come for a sword to be made for Heroshya that will be created from Sesshomaru's fang...he also informes that two additional swords will be created one for each of his daughters, Sesshomaru continues to explain that Heroshya's sword will be the strongest of the three swords possessing additional powers. Heroshya will receive his sword within a few days; the girls will receive their swords when they are mature at the age of 16 or 17. Heroshya is also told of the empire and Sesshomaru's plans for passing it down, Heroshya being Sesshomaru's first born son and the eldest of the siblings will be the heir to his thone however, Heroshya being a full demon with the power,strength and blood of the great dog demons... there is no doubt that He will earn his own empire rather than gain one that was passed down, therefore Sesshomaru provides Heroshya with the option to inherit the empire and add it to the one he will create for himself or He may pass it on to his half sister Nephra. The choice is his when the time comes. Lastly Heroshya is ordered by his father to protect the two girls at all cost and not allow any harm to come to them. Sesshomaru fears for his daughters, feeling that they.... being females and half demon, will be susceptible to demon and enemy attacks often. Sesshomaru remembers how he often under estimated Inuyasha for being half demon, believing that he was weak but now realizes he was mistaken however Inuyasha had to suffer through many battles with Sesshomaru before he was convinced. Heroshya is not happy with having to protect them. He does not tell his father that he saw the girls fighting demon children from the demon village instead he simply says, " I don't have time to look after a couple of little girls, besides something tells me they will be just fine fighting their own battles." Sesshomaru responds, "Then you will make time because it is my wish and an order. If you hear or see that one of the girls are in trouble you will assist them. Heroshya, you are the only one I trust fully with this task." Heroshya submits to his father's request but is most unhappy with this feeling that he has now just become a babysitter. Night falls by the time Heroshya is finishing his visit with his father, After moving to the upstairs area of the castle Sesshomaru provides his son with a map and directions of an area in the forest where he wants to meet with Heroshya to practice weilding the swords that is in the process of being made for him and the girls. Heroshya takes the directions and begins to leave from the castle, as he walks past the girls room he hears a little voice call out to him extending his name,........... "H-e-r-o-s-h-y-a" he thinks: hmmm, It's Nephra. He stops walking and looks into the room where the girls sleep, the room is very adequate for the little girls containing two beds, curtains, locker chest for each and one big candle for light in their room. Heroshya asks, "What is it?" Nephra requests, "Will you tell me a bed time story?" Heroshya finds this ridiculous and responds, "Do not ask me, Ask Jaken... that's what he is here for." Nephra once again requests, "but I want you to." Heroshya walks up to the bed where Nephra is snuggled and tucked in, he moves his cloak and sword out of the way as he sits on the side of the bed near her and exclaims, "Okay, I'll tell you one story that I know." Zephra is not interested in any bed time stories, she feels they are childish so she lies on her side, turning her back to Heroshya and Nephra. Heroshya begins his story, "Once there was this little demon princess that was about your age. She was very pretty little girl and she liked to pick flowers and play around her castle. Well one night when she was sleeping peacefully in her bed a horribly, ugly and huge demon with fangs kidnapped her right out of her bed, she screamed for her parents to help her but they could not hear her. The princess was never seen again but It's been rumored that she was eaten alive by the huge demon called Karooki...and til this day, night after night he seeks out pretty little demon princesses to kidnap in the middle of the night to have for his supper." Zephra hearing the story turns around to see Nephra is quivering with fear as Nephra asks Heroshya, "What about half demon princesses? does he eat them too?" Heroshya exclaims, "Oh yes, those are his favorite. Well good night." Heroshya blows out the candle and the room is pitch black dark as he leaves the room. Nephra having the trusting nature of her mother believes that what her brother is telling her is true and is afraid... she yells, "No, Heroshya don't leave us!!" Zephra seeing that Nephra believed his story and is now afraid sits up in her bed and yells, "Heroshya, You dirty dog!..How could you frighten her like that!" Heroshya leaves the room chuckling to himself, amused that his mean trick worked. Zephra is automatically wise and not as trusting, she knows that Heroshya was playing a mean trick on Nephra and spends most of the night trying to convince her that the story is not true and that Heroshya was being mean trying to scare her because he dislikes them. Rin keeps her daughters dressed in the finest garments due to her learning to sew well while living with Lady Kaede in the human village. With the help of the demon servants Rin is able to obtain beautiful cloths from different parts of the lands and use them to make outstanding Kimono's, sashes and dresses for her daughters as well as shirts and cloaks for Heroshya. As she retires for the night she sees her husband heading outside to the back of the castle where the blue lake is and decides to join him. The moon is big and glistens on the lake as Rin stands beside her husband and asks about Heroshya. Rin exclaims, "I see Heroshya has decided to leave again. I wish he would remain at the castle here with us, we have a wonderful room all set up for him but he never stays. It's because of me, isn't it?" Sesshomaru responds, "Heroshya feels that if he remains here at the castle, he would be abandoning his mother as he believes I did. Heroshya does not seem to understand that I have fulfilled my obligation to his mother by ensuring that our son has everything he needs, There is nothing more that I owe her. Heroshya knows that he may live here at the castle it is his decision to make. " Rin understands but feels empathy for Heroshya. Rin decides she is ready to head off to sleep however Sesshomaru has gone five days without sleeping being a demon and not needing much sleep he spends his time handling affairs of his empire thus causing Rin to have many nights alone without her husband beside her. Rin asks her husband, "My Lord, will you retire at home for the night?" Sesshomaru kisses his lovely wife and informs her he will retire at home with his family for the next two days and nights before he heads out to retrieve the swords he is having made. Rin is very pleased that her husband will remain at home for a couple of days. For the next couple of days Sesshomaru decides that he does not want to be burdened with any empire business requiring only to spend quality time with his wife and daughters. He informs Jaken to handle any problems or issues that arise outside the gates of the castle and to allow no one but his son Heroshya into the castle. The family are all together in a huge room of the castle as Nephra mainly stays near her mother helping with sewing and listening to her mother tell stories of her demon slaying days, while Zephra spends most time around her father who watches Zephra's fighting movements and techniques. Sesshomaru tells Zephra about the sword he will make for her and informs her that she will need to learn to handle a sword and uses a long wooden staff as an example to show her how a sword should be held and wielded. Sesshomaru is very impressed with Zephra's abilities but he is sensing that his youngest child will be troublesome and make many enemies. He advises his daughter to never go looking for trouble or a fight and to let it seek her out. Zephra explains to her father that she wants to be feared and well known all over the land as he is; she continues to say that although she is half demon....when she comes of age, she plans to be the most powerful of female demons. Sesshomaru thinks about Inuyasha and how powerful he has become, he knows that this is not impossible for his daughter if she wants it badly enough but he cannot help but fear for her safety and her life. The next day, It is Zephra's turn to take Au Un to a part of the empire that has plenty of grass and trees for him to feast on and a lake where she can give the dragon a good washing. Nephra normally enjoys doing this but she is assisting her mother with other things around the castle so it becomes one of Zephra's chores this day. While there, Zephra can hear male voices near by so she tells Au Un to remain there while she sees who is there, she steps through the woods quietly and lurks behind a tree as she notices Heroshya with two other demon boys about his age talking about the sword that belongs to their father 'The Buksaiga'. Heroshya brags to the other boys about the power of the sword as he pulls it out to show them. He wants to attempt to transfer some of Buksaiga's power and energy to his sword because he will participate in a battle tournament that most young male demons participate in at least once in their teenage years. He along with other male demons will fight powerful ruthless demons of the North Mountains to the death. Heroshya explains that his father has been resting at the castle and does not even know his sword is missing. Zephra's eyes raise in surprise from hearing that Heroshya has taken their father's treasured sword without his permission. She continues to watch in secret as Heroshya attempts to transfer a little of the demonic energy from the great sword to his sword for more power but it is unsuccessful. Heroshya realizes it will not transfer some of the energy and gives up. He tells his friends that he must return the sword quickly before his father notices anything and he rushes off back to the castle. Zephra returns back to Au Un. Once he is fed and cleaned, she heads back to the castle where Heroshya is speaking with his father. She is just in time to over hear Heroshya telling their father that the Demon Battle games begin today and that he will return to test out the 3 swords that have been forged when he returns the next day. Zephra feels this is a perfect opportunity for her to get something she needs. She goes to her father and sits on his lap as she requests, "Father, may I accompany Heroshya to the demon battle tournament? I would like to collect the bones, fangs and claws of the demons that perish there to create weapons with." Heroshya quickly answers her question, " I don't want company." Zephra continues on ignoring Heroshya's refusal, "I'm sure Heroshya will do well to protect me and keep me from harm." Heroshya again responds, "You are not coming with me Zephra." Sesshomaru looks at Zephra, "It is Heroshya's choice to make, it seems he would rather conduct his affairs alone. " Heroshya abruptly turns around to walk out of the castle to his battle tournament when Zephra says, "You are right father, perhaps I will sit with you and tell you all about my day. While in the woods by the lake...I saw an interesting group of boys handling a most powerful sword." When Heroshya hears this, he stops walking and his eyes raise slightly in shock as he thinks: She saw my friends and I in the woods. Heroshya reluctantly gives in, "Zephra, go and get a sack to carry the demon parts and let's be off quickly." Zeprha does as requested. With her sack tucked into the sash of her Kimono she climbs atop her brother's back as they fly off toward the Northern mountains where the demon battle tournament is held. As soon as they are in flight Heroshya scolds Zephra, "You little Rat. That was a dirty trick." Zephra swiflty replies, "It serves you right after what you did to Nephra. For some ridiculous reason she wants your approval and acceptance. I on the other hand couldn't care less about you or your approval Heroshya." Heroshya responds, "What ever, Just stay out of my way today Zephra. I can't be babysitting you and trying to fight at the same time. " Zephra assures him, "I will stay well back from your senseless battle. Just know that I intend on collecting those demon bones and parts when it's over. " At the tournament, Heroshya fights with perfection and excellence while Zephra waits close by but out of the way. She can't help but take notice of Heroshya's impressive fighting skills and takes a mental note for herself on his movements and techniques. Once the fighting is over and during all of the commotion of the undefeated demons celebrating, Zephra quickly slips into the tournament area and collects the bones and parts of the demons she felt gave the best fight attempting to collect the parts of the most powerful demons that perished in the battle. While collecting the body parts another demon approaches Zephra in a stern voice, "Girl, what are you doing? These demon parts can not be taken, they will be collected and forged to create a victory statue." Zephra says nothing and continues to collect what she needs. The demon continues, "Did you hear me girl!" He reaches out to grab Zephra and she uses her demonic power of slash blades at him, slicing off the hand he tried to grab her with. She responds to him sternly, "Leave me to my business you fool, there will be plenty of demon parts left for you to create your stupid statue." The demon is not badly hurt but is in shock at the way this little half demon girl snapped at him so viciously, he thinks to himself: that was surely just a warning, she must be powerful because she seems confident in her abilities. The demon decides to back off and let her collect what she needs. Heroshya, standing near by watching thinks: Zephra is absolutely fierce, she is going to make many enemies if she continues on the way she is. Once they return to the empire, Nephra is waiting near the castle to greet them both. Zephra tells her that she has collected these demon parts to create weapons for them to use on the nights they turn human, Zephra explains to Nephra this will be most useful. Nephra doesn't seem to be as excited as Zephra. Nephra asks Heroshya, "I presume the battle went well?" Heroshya tells her "Yes, of course." Nephra tells him, "I was sure that it would, so I've made something for you as a victory reward, I hope you like it." She hands Heroshya a set of fighting gloves as she continues to explain, "my mother helped me make them, they are made of special material, useful for gripping your sword during fights." Heroshya places them on his hands and they fit comfortably, he grabs his sword to test the way they feel and his grip on the handle is incredibly sturdy. He asks Nephra, "You made these for me?" Nephra smiles and nods. Heroshya still confused asks, " Are you not angry with me for scaring you." Nephra tells him, "Of course not, I could never be angry with you Heroshya. I know you don't like me but I like you, I'm happy you're my brother." Nephra stands there smiling, Heroshya can't help but feel some guilt as he looks down at Nephra's adorable smile and big gold eyes staring back at him. He once again fights and resists her attempt to bond with him as he coldly remarks,"I prefer not to think of myself as brother to half demons." Nephra quickly responds, "But you are and nothing you can do or say will change it." Heroshya throws Nephra a disgusted look as he attempts to walk away. Nephra decides she will defeat him with kindness and says, "Heroshya... I will always be here for you, no matter what." Heroshya groans in frustration as he turns around to her once again and says, " Why don't you give up Nephra ?! We won't be friends!" Nephra replies, "Because when you want something bad enough you don't give up. I'll never give up on you." Having spoke her peace, Nephra decides to go on about her normal activities. Heroshya cannot believe that she is so persistent with him; he also cannot explain to himself why he blocks her attempts. Meanwhile Zephra has informed her mother of the demon parts that were collected. Rin is pleased and tells Zephra that they will see Lady Sango about getting these parts forged into weapons for both her and Nephra. However Rin informs Zephra that though the weapons will be forged, they will not be allowed to use them until some years pass. Zephra gives her mother a bit of a hard time about this but by the end of the conversation, the rule has been set and Zephra must obey. Within the next few days Rin and Zephra ride with Au Un on the long trip to the human village to visit Lady Sango. Nephra not being interested in the weapons very much remains at the empire with Jaken. Lady Sango is there with the Monk and their two twin girls, Kohaku happens to be there also. When he sees Rin, all the feelings of passion come back to his heart and Rin feels a flutter in her heart as well as they embrace in a hug. Kohaku looks over at the little half demon girl Rin has with her and he notices how much the girl resembles Rin. Zephra talks to Sango and the other two twin girls that are there about the kind of weapon she wants, the two girls instantly take a liking to Zephra. Though she is younger, Zephra looks as old as they are and she is even more mature because of her half demon status. Zephra likes the way they seem to admire her and decides to befriend them and maybe she will mentor them and lead them later...Zephra thinks although they are full humans, they will be demon slayers like their mother; it will be helpful to have good fighters on her side. As the day goes by Zephra spends much time with Sango's twins, showing them some fighting moves and playing outside with them, while Rin and Kohaku catch up on conversation. when they are ready to leave Rin says goodbye to Sango and Kohaku. Zephra is standing near her mother when Kohaku kisses Rin softly on the cheek and says goodbye to her, they look into each others eyes in a way that says they regret having to leave one another again. Zephra notices this exchange of eye contact and is aware that this human man seems to be smitten with her mother as she looks at him suspiciously, she says nothing. Sango informs Rin and Zephra that the weapons will be finished in one month.